This post is written by Shelley Mann. Shelley is the founder of Umami Consulting, a company that provides marketing and public relations support for local, independent restaurants in Columbus. 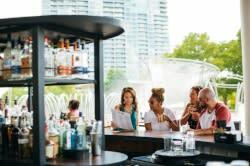 Chef Jacob Hough took over as head chef at Barcelona, the perennially hip German Village tapas spot famous for its lush patio, a year and a half ago. In that time, the 34-year-old chef has certainly made his presence known. For Chef Jacob, interacting with guests is a top priority, whether it’s through chef’s wine pairing dinners or an incredibly popular new series of chef-led cooking classes held in the restaurant’s dining room. The final themed class in the spring series, tackling the restaurant’s signature paella, is scheduled for May 25 and classes will return in the fall. 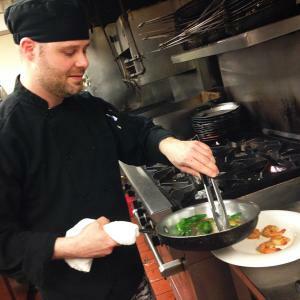 Why do you love cooking in Columbus? I’m originally from Ravenna, a small town in northeast Ohio. I love that Columbus still has a home-like feel to it for me. It’s also still up-and-coming, so we’re still seeing a lot of new things. I love introducing our guests to new culinary ideas and flavors and seeing their reactions. What sets Barcelona apart from other dining experiences in Columbus? From the get-go, our service is amazing. We know if our guests are here to celebrate an anniversary or a birthday, and we cater to their needs. We ask them what their evening looks like: Are they going to a show after dinner? Our servers really engage with our guests, so the entire restaurant is very in tune to them. What’s new and exciting at Barcelona? We’re always pushing ourselves in the kitchen to try new things. Our tapas menu changes every week, and certain items on our dinner menu change as well. We’re always looking for the new, exciting and seasonal ingredients. Ramps are in season right now, so we’re incorporating those into our tapas dishes. We’ve been starting to experiment a bit with molecular gastronomy, too. Our sous chef Patrick served spherified Chambord pearls in Spanish cava as part of his Cordials and Tapas pairing dinner. This week’s tapas menu has a basil oil powder that our sous chef Todd has been playing around with, and we recently made our own house-smoked lamb bacon using a handheld smoking gun. Can you recommend two must-order dishes? Something signature and something seasonal? Our short rib and scallop paella is always on the menu, and it’s just got this really good balance of flavor. Then we have an Ohio Berkshire Pork Chop right now that’s served with a peach and bourbon butter. It’s amazing.